What’s so foreign about foreign policy? In a time when so much of U.S. foreign policy involves our global military footprint, ongoing engagements, waning engagements and threatening engagements, it’s easy to think that war is the sole function of that governing platform. Americans are conditioned that way; like a computer that insists on entering a discarded wi-fi password at your favorite cafe, many young voters cannot remember a time when it was not how we operated in war that ran our international relations, but how we manage our peace. God, and the voters, willing, that period will return soon. How much does Israel trust/distrust/appreciate/deprecate the current/future relationship with the United States, and who will do more to continue our relationship with our “most valued ally” in the region? Part of President Obama’s closing statement has to be how much his administration’s leadership (and he must use the word “leadership”) has improved America’s standing in the world, with more rational approaches to diplomacy, in searching for active partners for non-violent approaches to global issues, and creating willing partners with whom to pursue peace (and new enemies, through drone attacks, but he won’t admit to that). He has to show that given the hawkish, isolationist, Bush era foreign policy advisers that the Romney campaign employs, it is likely a Republican administration would return us to the “cowboy diplomacy” that got us into this Middle East mess in the first place. Like the Great Recession, he should explain, it is going to take us a while to extricate ourselves, and a President Romney, who still sees Russia as our number one threat, would dig us in deeper. Romney will make it about the economy – oil drilling, trade, debt to China, jobs – and expect the word “apologist” to come up once or twice, in the context “American exceptionalism,” in a statement like, “America should not go around the world apologizing for our actions, which are always right.” It’s not that we never make foreign policy blunders, but he will pursue an agenda of our might making us right. In the early days of my time at CNN, back in the 1980s, Ted Turner made a conscious decision to change the name of CNN’s foreign desk to the international desk. That tradition continued with the establishment of CNN International, a few years later. It symbolizes that just because the news takes place on soil that is outside the United States, it’s not foreign to the people who live in that country. It is an acknowledgement that we, as Americans, are part of an entire planet of people, made up of many nationalities and ethnicities. That move has been validated by the the success of CNN International, abroad, because even though CNN is struggling with 24 hour news competition at home, it is still the most important news station to most of the rest of the world. 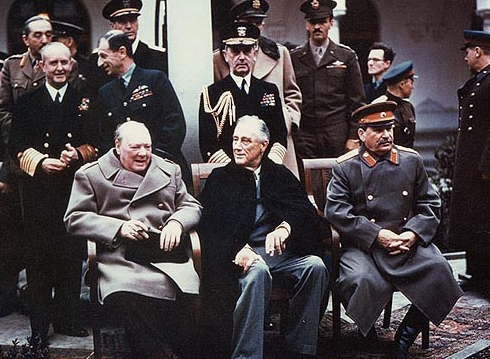 Churchill, Roosevelt, and Stalin at the Yalta Conference, February 1945. U.S. Army photograph. The lesson? Our success doesn’t come from being “exceptional;” it comes from acknowledging that we are a leader of the team of nations – a leader, but still only a member. We succeeded in the two world wars, not because we thought of ourselves as the cavalry, riding to the rescue, but because we saw ourselves as standing shoulder-to-shoulder with other nations against a global menace. Sure, we showed military, scientific and industrial helmsmanship, but only Yankee braggadocio can turn a rise to leadership into being the country that knows what’s best for the rest of the world. That imperialist attitude will get us nowhere, but it still could get Mitt Romney elected, which is the same thing.